Increasing demand for agricultural commodities in emerging markets is creating pressures on the global supply chain. The need to transport increasingly larger volumes of crops to consumptive markets is expected to result in an increased frequency in bottlenecks along the supply chain. Substantial amounts of capital will be required to support investments in infrastructure and logistics capabilities, including greenfield projects in emerging markets and consolidation of and upgrades to depreciated assets in developed markets. 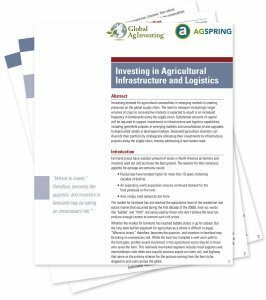 Seasoned agriculture investors can diversify their portfolio by strategically allocating their investments to infrastructure projects along the supply chain, thereby addressing a real market need. Please fill out this short form and you will be provided a link to download the paper immediately.